Van Hise Hall features two study spaces. These are not reservable, and are designed for drop-in use. 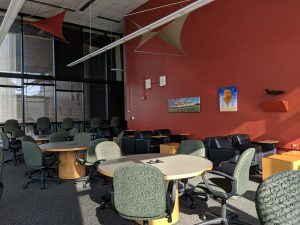 Located on the second floor of Van Hise Hall near the building’s east entrance and just adjacent to our AV Pool and Library Collection (259A Van Hise), the Commons is an attractive drop-in study space for students. This area may be used by individuals or small groups, and food and drink are permitted. This is not a silent study space, and quiet conversation is welcome. 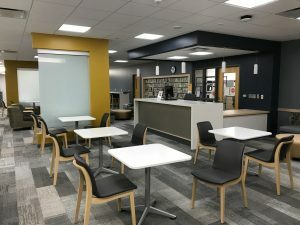 A variety of seating is available, including: two-person café tables, casual seating with coffee tables, a laptop bar, and computer kiosks. Electrical outlets are available throughout the space. On the fourth floor, Room 455 may be used for both individual and group work. Food and drink are permitted. Though this is not a silent study space, the noice level is typically low. A variety of seating is available, including: standing height workspaces with tall seating, round tables with rolling chairs, and casual seating with coffee tables. This space also features ample electrical outlets, artwork, and panoramic views of campus.